The TV industry is still keen on 4K TVs but to a certain extent, it's moved on from the dream of 4K OLED televisions in favor of less expensive LEDs. Not LG though, they've got seven gorgeous new UHD OLEDs. That's on top of its fleet of 4K LEDs, announced last month. 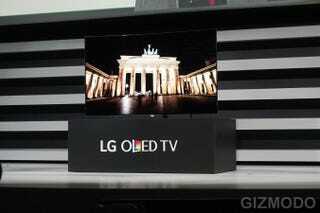 LG has long been a leader on OLED televisions. From a consumer point of view you should be excited because in terms of current technologies, OLEDs produce brighter colors and the deepest blacks. The TVs will all come out this year, and include a 77-inch flexible model that can be either flat or curved; a 65-inch flat unibody, a 55 and 65-inch floating flat model, and 55 and 65 inch floating curved. Like the LEDs announced in December, these TVs will run LG's WebOS 2.o platform. LG announced that its sister company LG Display made a $600 million investment in OLED, so the company is obviously doubling down on the technology. No word on how much the TVs will cost—probably a bundle!—Or when we can expect to actually be able to buy them.